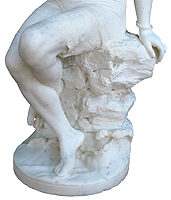 A Fine Italian Late 19th Century "Belle Epoque" Carved Marble Figure of a Young Bather. 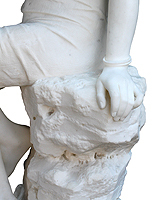 The seated young girl wearing a form-fitting one-piece tank suit, holding a hand fan, and seated on a rock form by the sea shore, her feet intruding into the breaking waves. Unsigned. Circa: 1900. 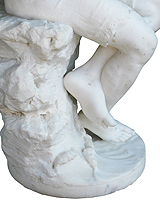 A Fine Italian Late 19th Century "Belle Époque" Carved Marble Figure of a Young Bather. 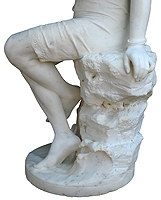 The seated young girl wearing a form-fitting one-piece tank suit, holding a hand fan, and seated on a rock form by the sea shore, her feet intruding into the breaking waves. Unsigned. 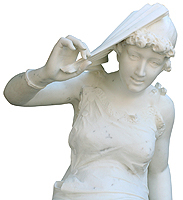 Circa: 1900.